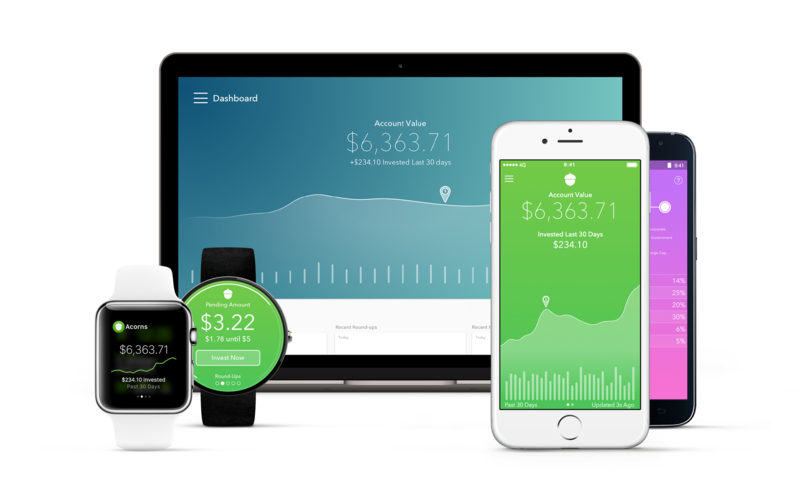 Last year in December (of 2015) I enrolled in a little-known application called Acorns. This company would look into your transaction history; all of your credit card and other purchases, and then round up to the nearest dollar from the purchase and take the difference. They’d these small amounts of money up, anywhere from 1 cent to a dollar, and once you had $5 available, would invest these micro-investments into a series of mutual funds. I didn’t expect much out of this since we’re talking literally pennies per purchase. But I was wrong. Site after site emphasizes the importance of investing whatever you have to work with. So while I invest already in a number of different ways, I decided to give this a try. From $5 onward my balance slowly started to grow. Eventually I started to see returns outside of my investments as dividends were given and funds sold. I don’t ever expect this to become a nest egg for me, but I do use it for an emergency fund. 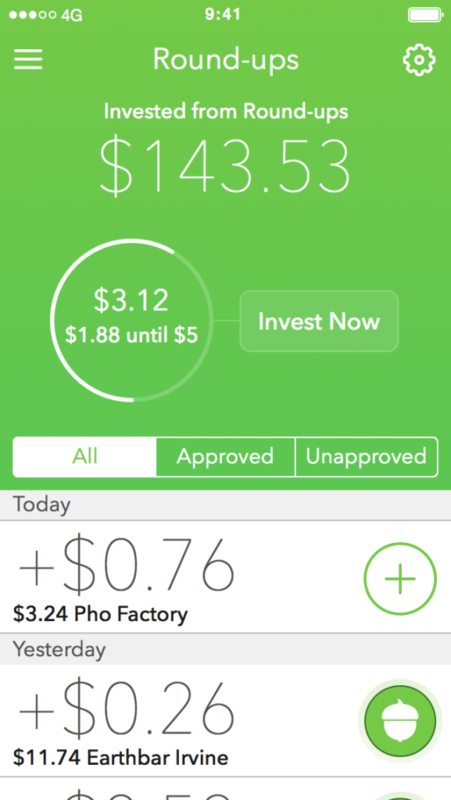 I slowly invest as I make additional purchases, and it acts basically as a savings account earning around 3% for me. If I had an unexpected expense like maybe one of my cats got sick, I’d just withdrawal from the account and be on my way. Normally you can get $5 when you sign up but they seem to be running a special where you will get $10 free for signing up. Check it out here. As I normally do at the beginning of each year is to reflect on how things went in the previous year. Topics are a general reflection, financial, and fitness. This is the first of these posts. 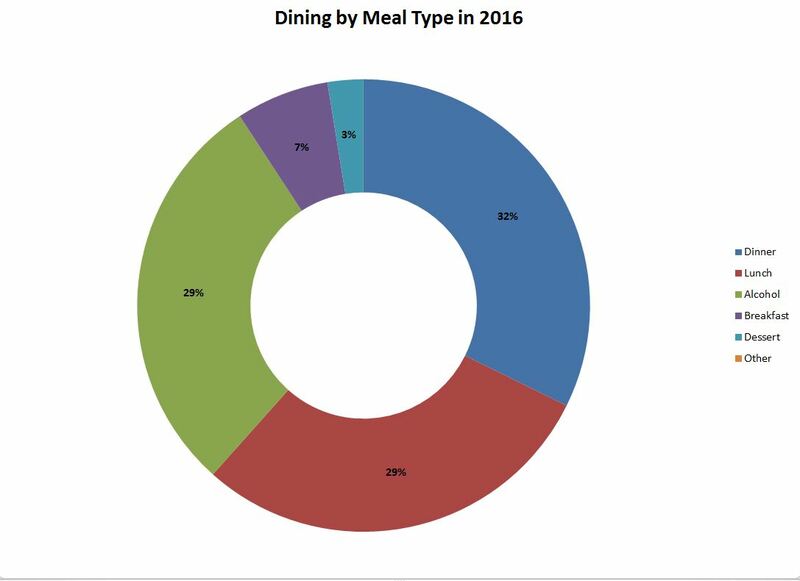 In general I spent 6.90% less this year on dining than I did last year. However, I am spending too much of my dining budget (and exceeding my planned budget for dining) the majority of months. The top three categories: dinner, lunch, and alcohol, I have a lot of influence over. Instead of ordering out or dining out for dinner, cook food. Instead of going out for lunch every day at work, bring a lunch a few days a week. As for alcohol some of this will drop as dinner dining out goes down, but also spend less time drinking, reserve it to not drinking during the week, or perhaps go on discount days like Goose Island does. My analysis has shown that even though I eat out more often the overall cost of the meals are less. I believe I have identified the reason because at my last company we would grab drinks during lunch or after work pretty often. I don’t do that now. This would account for a large amount of the nearly 7% decrease in overall spend. Ideally I wouldn’t spend as much on groceries as I do dining but also that groceries last longer and make more meals. 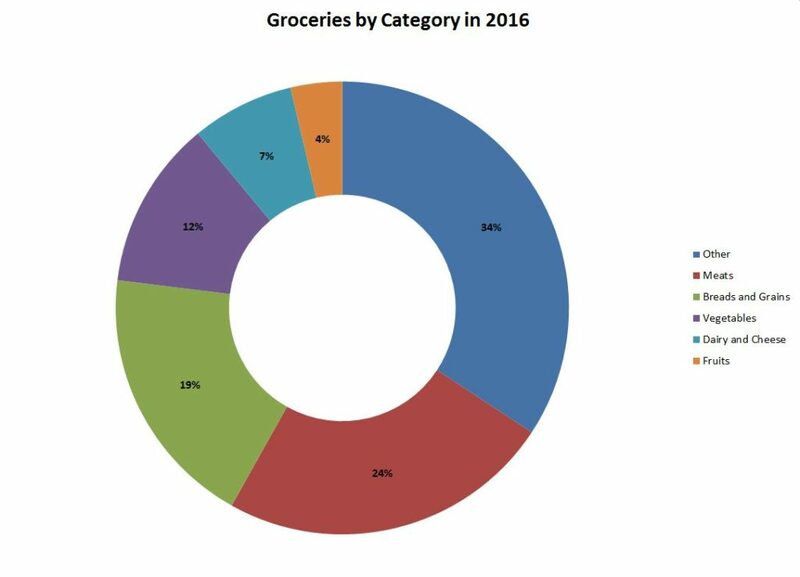 This is true for 2016, but I’m spending more, 17.5% more, on groceries this year than last. Additionally, as seen in the graph, the “Other” category is the largest group, which means that I need to determine additional categories to track against. Meats are by far the most expensive, so reduction in meats will result in less cost as well as healthier eating. Generally though I need to plan out my meals better to make grocery shopping more efficient. It’s also important to note that just because I don’t spend a lot of my overall grocery spend on fruits and vegetables doesn’t mean I don’t buy them often. These are normally much cheaper than meats and therefore don’t contribute to a lot of my overall spend. I have entire grocery visits of just vegetables and fruits. Additionally, the $35 a week experiment that I did a few years back seemed to work pretty well. So if I up that to say $50 a week so that I can get leftovers enough to also bring lunches, this should influence both budgets in a positive way. Did I travel more in 2016? Well, I don’t think so, but I did spend more on travel overall, nearly 53% more to be exact. Where did the increases come from? I did take a few trips this year but didn’t rent a car or have large expenses with them. I had a nearly 38% increase in airfare costs this year. This could be caused by not having the points budget at the time of travel to not have to pay for tickets. Airfare is also increasing in cost. I started spending on tolls this year whereas I didn’t at all last year. This is caused by having a job that requires me to travel to suburban areas of Chicago now and there are tolls on the roads. With this change, I also recorded a 171% increase in gas spending this year. Again, this is due to having to drive to the suburbs for work. Spending doesn’t really give a good picture of overall financial health as this category does. I’ve broken this down into four categories: saving contributions, investment contributions, retirement account worth, and overall net worth. This year I recorded a 58% increase in my savings contributions. This means money I put into saving accounts increased by 58% in 2016 over 2015. It’s a pretty large amount and this year I’ll probably reduce that some to allow more to go into investments instead, where I can potentially get a higher return. As for overall investments (which are contributions made to investment accounts – not retirement or 401(k) or the like) I increased overall contributions to these accounts nearly 47%. This doesn’t reflect a 47% increase in net worth, per se, just that I contributed 47% more to them. I didn’t calculate overall net worth change for these accounts. Retirement account contributions (things like IRA contributions and 401(k)) also rose in 2016 by 26%. Again, this does not reflect overall increase in value, just contributions. I didn’t calculate value change, but I do know it’s higher, not as high as 26% but I did have a very good year and is in the double digits. Lastly, and probably the most telling metric, is net worth. Take all your account balances and assets, subtract the debts and liabilities, and you get a value. That’s your net worth. This year was a good year for debts and liabilities for me as I finished paying off all of my student loans in December of 2015, five years ahead of schedule. Therefore this is my first year completely debt free. Overall my net worth increased nearly 5.5% in 2016. While I’m quite proud of that number I hope to increase it with smart investing and savings and reducing overall spending.